The day has finally arrived last Saturday when it was actually too cold outside to do anything in the garden. Well, that's stretching it a bit I know, it wasn't really that cold and I'm sure we could do lots of other things if we really wanted to but the nippy weather outside was a great excuse to have a day out instead and off we went to RHS Wisley to check out the first day of their new winter attraction, Butterflies in the Glasshouse. RHS Wisley is a great place to visit even in the middle of winter, for the winter interest outside but mainly for their large glasshouse which you can take refuge in to, away from the cold and into the warmth where you can enjoy strolling around, looking and surrounded by beautiful exotic plants from warmer regions. The glasshouse is divided into different sections (arid, temperate, humid, etc.) to suit the growing conditions needed by various exotic and wonderful plants from warmer regions, beautifully displayed and the plants are the main reason in itself to visit the place (which I will feature on a separate blog). But for now I will focus on the current attraction which are the exotic butterflies! Within the glasshouse is a 'tropical humid' section and it is there where the butterflies can be found freely flying amongst the plants. I was a bit hesitant at first, going to the first day of this seasonal attraction, worried that the crowd would be so large and overwhelming that we wouldn't enjoy the place. To a certain extent that was the case with a queue forming to go inside the tropical humid section which it took us awhile to actually get in but fortunately the wait was far from boring as we were surrounded by beautiful plants and the slow movement gave us ample of opportunity to take photographs of the specimens (which we will feature on a separate post). And finally, we got in and it was well worth the wait! Once inside, you can stay for as long as you wish to admire the plants and of course the butterflies. Despite the queue it didn't feel overcrowded inside and you still had ample space to stroll around and take photos of these wonderful creatures. And here they are, just some of the butterflies.. It was a most enjoyable day and was great to see the glasshouse again, and of course the butterflies! A day out like this was just what we needed, feeling refreshed we spent the next day doing a few more bits towards our project. Looking forward to visiting again, perhaps in the spring and/or summer, time permitting. The butterflies may not be there by then but there's plenty more to explore at Wisley, both inside and outside the glasshouse. Fabulous pictures! I'm going tomorrow, with a bit of luck. 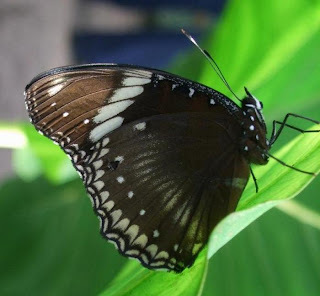 Mark - great butterfly photos. Even in a glasshouse, they don't like to sit still for long. Love the broms in flower too. If I lived in England I'd be there all the time, for the warmth if nothing else. Fantastic photos. Can't believe how many people were crowded in there. They must have needed a day of being refreshed also. The butterflies are gorgeous. Lovely pictures. I need to learn how to garden like these greenhouse gardeners. I struggle to keep my indoor plants alive and not infected with aphids. Does the place breed those butterflies? Outstanding! These are definitely not your typical butterflies! And the plants, wow. Mark and Gaz, thanks for sharing pictures of your visit to Wisley. That is one garden that is on the top of my "must see"-list. So nice to get a preview through you :-)! The glasshouses are already pretty (architecturally) from the outside, and I love your shots of the tropical plants, but of course, the butterflies are the stars of this post! It is so fascinating in how many forms and colors they come. My favorite is the one on the last picture. What a dark, mysterious beauty. What a wonderful winter excursion! It must have made you feel like you had been whisked away to a tropical paradise. I am so jealous of all the glass conservatories and botanical gardens in europe. It seems there's one set up in every major city. How civilized. There is no better place in the winter then a glass greenhouse set up to be tropical paradise. Hi Victoria, hope you had a nice time and looking forward to your pics! Hi Missy, you'd love it :) Fortunately there's a good few glasshouses to choose from. Kew also does butterflies in their glasshouses but in the summer instead. Cher, it was a good excuse for a day out :) Children love butterflies hence lots of families in he crowd. Wow, that's amazing. How come I don't get to have as many days out as you two? I'm going to have words with 'im indoors! I guess I wouldn't mind the queuing. Truly paradise even for those who have created alternative eden. Hi Mark, those are real lovely tropical corners, i bet you miss home more. That taro is just like the taro i've been uprooting for two years now scattered in our property. I wish to eradicate them to minimize mosquitoes. It is very difficult to vanish as even a very small part will eventually grow when the rains come. Those butterflies are also what i see here, i wonder if my friend entomologist is responsible for shifting those pupa to that conservatory! David, you will have to persuade 'im to have more days out! Alistair, the queue was not that bad, especially as we were surrounded by atractive plants the whole time. We must compose a blog about the rest of our visit! Rohrerbot, glad you found us, and hope you enjoy following! Andrea, where ever people create a garden, we all tend to wish to grow something from another region. All part of the challenge! Perhaps your friend was involved? There was a display section about where the butterflies had come from, although it was rather crowded so we skipped that part!